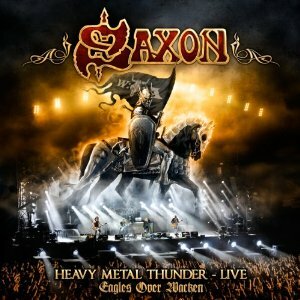 Saxon have just released "Heavy metal thunder - Eagles over Wacken" in a variety of formats. The first is a DVD + 2CD's. The DVD is a "Best of" compilation of Saxon's performances at Wacken Open Air from 2004,2007,2009. The CD's are the band's live show at Glasgow in April 2011. The second option is a single DVD - the same "best of" disc as in the first option. The third option is a double CD of the band's 2009 Wacken performance. There is a vinyl album version available - again of the 2009 Wacken performance, spread over 3 LPs. The ultimate edition though has to be the version only available for fans to order via the bands website and limited to 500 copies. This contains - Digipack - "Best of“ DVD, DVD - W:O:A 2009 - Fans choice Setlist (full Show), DVD - W:O:A 2007 (full Show), DVD - W:O:A 2004 (full Show) and a Saxon Flag. Sadly this version sold out straight away. This review is of the Double CD - which contains the band's full live show from Wacken 2009. As someone who was at Wacken that year and thoroughly enjoyed Saxon's excellent performance then this is an album I was looking forward to hearing since they announced it. The CD booklet is packed with great photos of the band's performance, but it's slightly disappointing that there is no text to give a bit of information such as to explain why they got fans to vote for the setlist. The show was the band's 30th anniversary, as well as being the 20th anniversary of Wacken which is presumably why they decided to let fans vote in advance on the setlist, but it would have been nice to hear from the band on this. The audio quality is excellent, and despite Biff making a slip or two when speaking to the audience (he introduces the show as being their 20th anniversary before correcting himself and saying its their 30th anniversary), when it comes to the singing he doesnt put a foot wrong. As you'd expect from a fan voted setlist then you've got plenty of classic hits - "Strong arm of the law", "Denim and leather", "Crusader", "747 (strangers in the night) and "Motorcycle man", but you also get a few songs that they might not play that often as dedicated fans do like to hear different songs sometimes so a vote on a setlist gives them that chance. In this show we got a few songs including "Unleash the beast" and "Rock'n'roll gypsy" that I don't think I've heard them play since. Saxon put in a great performance on the night and it's been well captured here - a great live album that I'd recommend to any Saxon fan.